I was poring through a book about Egypt one day and came upon a picture of a scarab amulet. What would it be like if these things were actually in a swarm? At the time, I was experimenting with drawing perspective and wanted to see for myself what it would be like to have more than one perspective in one picture. It turns out the effect is much like having many creatures buzzing about your head at once. In ancient Egypt, the scarab was a depiction of the Sun God Ra, who carries the ball of the sun across the sky each day, giving life to the body and transforming the soul. The scarab does the same thing, only with a ball of dung, which it keeps as food and shelter for its larvae. In the most general sense, the scarab is a symbol of regeneration. Another day, another ball of crap. Mixed media, 18 X 24. 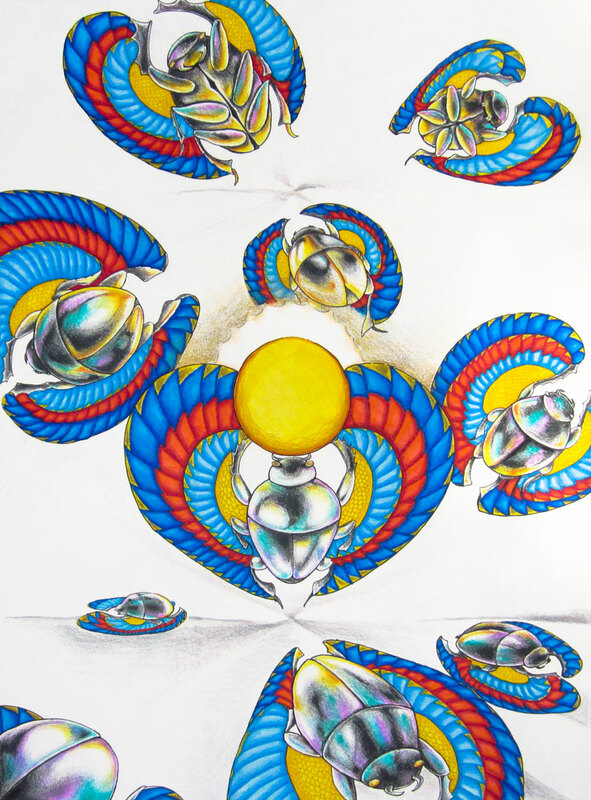 This entry was posted in Art, drawings and tagged Art, drawing, dung beetle, Egypt, perspective, Ra, scarab, sun by selina. Bookmark the permalink.